Home » books , death troopers , reviews , star wars » DEATH TROOPERS: Gory good horror in the Star Wars galaxy! 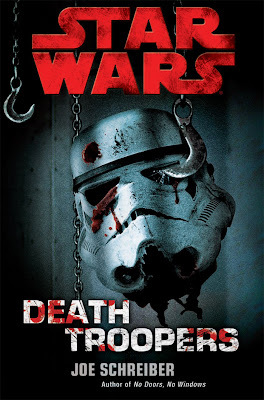 DEATH TROOPERS: Gory good horror in the Star Wars galaxy! Star Wars: Death Troopers is the craziest detour I've ever taken as a life-long fan of the saga. When word of this book came awhile back, the notion of a Star Wars horror novel... aroused considerable curiosity, concern and consternation. Yeah, Star Wars had (kinda) attempted scary literature before but let's get real: the Galaxy of Fear "young adult" books only came about 'cuz of a desire to tag along with the then-wildly successful Goosebumps series. Death Troopers however, is the first-ever stab at blood-curdling horror in that galaxy far, far away. So... did author Joe Schreiber pull it off? I've no doubt it's probably just personal taste. The perfect kind of horror in literature, in my mind, is the kind evoked by writers like H.P. Lovecraft, or Richard Matheson. The sort of gnawing uncertainty about being cast alone and adrift with no idea what the hell is making that god-awful sound behind the walls. On that note, Death Troopers almost satisfies completely as a horror story in its own right. Not quite all the way though.... but enough that I have to note that I am very much looking forward to Schreiber's next Star Wars horror novel (which he is already writing). Death Troopers is certainly the most visceral Star Wars story in a great many moon. Some of the stuff that Schreiber came up with is maximum gross-out: nightmarish in our "real" world but put it in the Star Wars universe and the effect is particularly disconcerting. I liked that! Death Troopers isn't that totally perfect horror entry for the saga, and it doesn't have to be either. This was the first time anything like this has been tried... and with Death Troopers Schreiber has definitely proven that there is a very rich potential of horror genre for Star Wars that has until now not been tapped into. I haven't read any SW books in years. Do you have to have any of those plot lines to get this book? Unfortunately, it's with Galaxies, a game hardly anyone plays now. Thanks for the review, will go out today and pick it up. I was waiting a true fan of Star Wars that I know of to review it.